Doing things with English 101, or Virtual Learning Spaces in Action! Steve Greenlaw, of Pedablogy fame, noted a while back that the posts on bavatuesdays have been more like reading cuneiform on a tablet (notice the equation of ancient communication with the tablet) than a resource for teaching and learning. To rectify such egregious neglect of the tireless minds that animate the tools, I have decided that over the next couple of posts I will take a look at a few exciting things that have been happening here at UMW lately. I’ll start with a project that has personally re-invigorated my relationship to writing workshop. I am currently teaching an English 101 class and – having taught this class a multitude of times at CUNY – I was, at first, a bit unenthused. Such a short-sighted approach was soon remedied when I started conceptualizing an approach to teaching this class at the very interesection of my own training which is both as an academic and an instructional technologist. How can I practice what I preach and integrate technology seamlessly and effectively into my teaching? One of the immediate concerns I had was balancing the learning curve for new technologies with solid, rigorous content. I had been in conversation with Mikhail Gershovich, a fellow CUNY Grad Center Ph.D. candidate and Director of the Bernard L. Schwartz Communication Institute at Baruch College (check out cac.ophony for all the great work they are doing there), who specializes in Composition and Rhetoric. He suggested I take a look at David Bartholomae and Anthony Petrosky’s Ways of Reading as the base text for my class. At first I was a bit concerned about the length and complexity of the readings in Ways of Reading-which range from excerpts of Foucault’s Discipline and Punish to Gloria Anzaldua’s Borderlands/La frontera. I did not want to create a space where the text became a source of dread for the students. On the other hand, however, I also didn’t want the course to degenerate into a series of quick, surface readings that set up the cliche arguments that can make 101 so dreadful for both students and instructors. After looking at the book for a while and working through the thematic organization of the essays I committed to it (unlike the Hammer I am not too legit to committ). As with any exciting class, the texts, readings, discussion, and general vibe of the group coalesce into something more than a quantifiable, tangible cause and effect relationship. However, the organizaton of my class within the framework of the web (something I am terming a ‘virtual learning space’) has opened up some really exciting possibilities through which I can augment the readings, discussions and, in particular, the writing workshop. 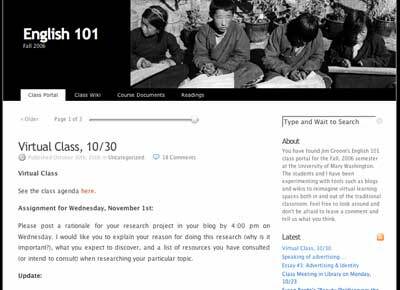 1) Creating a class portal: I am using a single WordPress installation to frame the class (link). This is what I am loosely terming the “class portal.” Here I post announcemnts, youtube videos that reinforce the readings, flickr photsets for discussions, the essay topics, etc. I use the right-hand sidebar as a space for links to the student’s individual blogs (more on this shortly), recent posts, and research links. The tabs in the header offer links to the class wiki, course documents, and readings (which is protected). Overall, this is the one-stop shopping for the students to get to any place they may want to go to in regards to the class, be it administrative or otherwise. It is an interactive calendar that traces the notes, agenda and class activities (including wikified group work) for that particular day (link). It is also a space for student to workshop their papers with one another, and while their peer reviews of one another’s work is locked down for logged-in users only, consider this: I have each student read and comment on at least two other students papers that have been posted in the wiki. They must comment on the discussion page that accompanies the essay. After that, I ask them to revise the draft. What is important here is that each of us can closely gauge our individual process of drafting the essay by utilizing the mediawiki version history option. A tool that for many Comp/Rhet folks makes the task of tracking recurring phrasing, syntactical, and grammatical issues that much more effective and easy. In fact, this workshopping method, which we have done several times in class previosuly, was the premise for our first virtual class (link). The wiki is a place to collect and build upon resources. I think possibly the most valuable part of a wiki for teaching may be that it is so easily edited and re-used. When I think about it, notes, discusssions, an interactive course calendar, student essays, the syllabus, and other sundries are all in one place online and easily portable to another wiki or reframed within this one. Managing your documents for a class over a semester was never easier, nor was having students turn in work nor tracking down when they did turn it in (the management side of teaching becomes a lot more streamlined for everything is documented for you in the wiki -you simply have to come up with a way of organizing the class materials that makes sense for both you and your students). 3) Student blogs: This is one part of this class I might rethink in another iteration. I had the students sign-up for their own WordPress.com blogs and it was really quite easy for everyone involved. (I am considering using Lyceum Multi-user WordPress blogs next time, for that would give me a little bit more control over each of their blogs in terms of plugins, categories, feeds, etc. But the benefit of WordPress.com is arguably greater because they can use the blogs long after 101 is a mark on their transcript -I guess the techy in me would just like the experimental/laboratory feel of Lyceum). The students are using their blogs to answer reading questions, track their research, publish “more finished” writing assignments, etc. It is also a venue I use often in class to talk about their writing as well as having the students comment upon one another’s blogs before we start the discussion – a variation on the in-class writing assignment. 4) What’s missing? del.icio.us, of course. I have yet to create a del.icio.us account for the class wherein they can share their research links with one another, this must be rectified soon. I’m workin’ on it, #$%#@! Well, that’s the long and the short of it for now, take a ride around this virtual learning space and let me know what you think. Is this a viable alternative to current course managment systems that you’ve been using lately? Inquiring minds want to now, and don’t worry bavatuesdays will keep it on the Hush Hush. This entry was posted in WordPress and tagged blogging, Hacking a Virtual Learning Space, instructional technology, mediawiki, open source, web 2.0. Bookmark the permalink. 12 Responses to Doing things with English 101, or Virtual Learning Spaces in Action! Great post. Thanks for the nod, Jim. The url for the Institutes’s blog is http://cac.ophony.org. Fantastic post, Jim, and though your answers may not be definitive, they are pointing us all in the right direction. Though, to argue for a correction in the record, I don’t believe I was ever really the negative-nelly towards the instructional wiki that you claim. As a matter of note, I recall showing you Amit Ray’s use of wikis in the classroom (lots to see here)and having an animated discussion about the possibilities of this stuff. Of course, I’ve been stuck in dissertation and fellowship land, limited to theorizing, evangelizing, and hand-holding on instructional technology, while you’re out there making it happen with students. @Luke: I totally agree, and I was not trying to paint you as negative, just hostile:) In fact, that site you showed me is what started us talking and I think that has been a model for me ever since. So, who’s the grasshopper now?! See, this stuff doesn’t happen in a vaacum, it happens through conversations like these. I love it! @Mikhail: Sorry for the bad URL, I corrrrrrrrrected it, Mr Torrance! A quick follow-up, while writing about the potential for web-based tools for learning, teaching and sharing, one student from the class delivered a real gem about technology, advertising and beauty. Check out this recent comment on the class site -thanks Krysta! The potential for his stuff is so exhilerating! If you didn’t click on the link for Krysta’s comment, than you HAVE to link here. Trust me, you will not regret it. Funny. Just the other day I forwarded that link on to a bunch of friends–I can’t remember where I found it, but, you’re right it is a must see. Ways of Reading changed my life. I was introduced to it eons ago in my first UR incarnation, and until I went to my Desert Island Disc 101 theme, I used it religiously. My favorites were Percy’s “The Loss of the Creature” (an absolute must, and a classic head-breaker), the excerpt from Woolf’s “A Room of One’s Own,” Richard Rodriguez’s essay (the title of which escapes me), and Frick’s lousy but eminently teachable essay on Madonna, now sadly omitted from the text. There were one or two others as well but they’re lost to the mists of memory. We need to talk about this text! Other than that, Mrs. Lincoln, the rest of the post is brilliant too. And what better course than 101 to move into full-on 2.0? We need a new model of freshman comp. You’re blazing an important trail here, my friend. Always great to hear from you, and the word on the web is that your presentation at the NMC regional conference was outstanding. I will have to find an hour soon so that I can listen in as you effortlessly shoot diamonds into the collective forehead of your audience. Bravo! I look forward to re-covening soon! As for the the 2.0 101, it still has a ways to go, but not half as far as the proprietary bohemoths! Happy to have stumbled onto your site. Just out of courtesy, I’m letting you know that I’m “stealing” your wiki approach (with adaptations, of course) for my own high school classes in Korea. Feel free to visit and discuss ideas and resources! oops: make that sanguine8 dot livejournal dot com –not ‘sanguine9’! Hi Jim Groom – I came across your English 101 blog as I am burning the midnight oil putting together my own summer online English 101 course (for the first time). I’m an English teacher at a community college. You put together such a fantastic – everything I am trying to do – virtual course here. It’s kind of….wierd and fun ….to see that we have some similar assignments. Last semester I used the Dove Ad and Adbusters for a Youtube assignment. I rely on teaching Paulo Freire’s banking concept of education, too, but I didn’t have students write about it. I’m a new college teacher (formerly high school) and am learning so much. Thought I’d tell you how interesting and creative your course is. Love the way you use Wikis – I am trying them too. When mine is up and running, I’ll ask you to give me a holler. You inspire! Wow, Kathy, thanks! I keep forgetting people might stumble upon that stuff, yet that is the very reason why it’s all out there – as an imaginative resource. I would love to see your class when it is ready for prime time, and as for the syllabus and course design -the YouTube videos, in particular- changed (and are continuing to change) the way I can teach oh so many issues and topics. It is an exciting time to be a teacher!